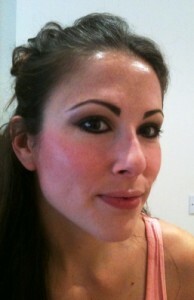 My foray into the world of natural beauty products hasn’t yet extended to natural makeup products. Until now. Having never come across a natural or organic makeup range on the high street, I was doubting that they even existed, and I certainly didn’t think they’d be as glamorous and beautifully packaged as the other various alluring options at the counters of Selfridges et al. Not that beautiful packaging is what’s really important, but you know, it helps. So, when I stumbled upon celebrity make-up artist Rose-Marie Swift’s range ‘RMS Beauty’ on CultBeauty.co.uk I was thrilled! Not only are these products chemical free and full of gorgeous organic oils and mineral colour, Rose-Marie’s motto is that your skin acts as “a mirror to your gut” – something I’ve always strongly believed. And if that wasn’t enough to sell me, the packaging looked beautiful too! I ordered two products: ‘Living Luminizer’ (£30.00), an organic coconut oil based mineral illuminator with Rosemary extract, and ‘Lip2Cheek’ (£28.00), organic coconut oil, jojoba oil and argan oil based lip and cheek nourishing cream product. I waited in eager anticipation for my package to arrive, which took ages as no one was in the first time round and the lovely Post Office held it hostage for a week, then sent it back. Annoying. So…when it finally came I was giddy with excitement! The makeup was beautifully wrapped in tissue paper which I unwrapped to reveal two little white cardboard boxes. Inside were two beautiful round glass pots with white lids. Ahh, the excitement! This was dashed slightly on opening the Lip2Cheek and realising I’d ordered the wrong colour…typical me…I thought maybe they’d sent the wrong one, but no. I’d meant to order ‘Smile’, a beautiful peach colour which I thought would be the perfect subtle blush for summer. But instead I accidently ordered ‘Illusive’, the darkest, almost purple shade. I have to say I think this is an easy enough mistake to make on the Cult Beauty site as the default image on the product page is ‘Smile’, but the default ‘add to basket’ item is ‘Illusive’. I might have been pretty annoyed about that, as at £28 this isn’t exactly a cheap product (certainly on the higher end of the scale of what I’d usually pay for a blusher or lip product), but actually I was pleasantly surprised. The colour blended in really well to my skin and didn’t look too dark after all. In fact it is like a blusher and bronzer in one. It’s too dark for my lips though, so next time I will make sure I order a pinker shade! Here are some photos of me with both the products on. Sorry for the poor quality – I find it impossible to take a flattering photo of myself and the iPhone camera doesn’t do any justice to the colours or highlight effect of the luminizer. 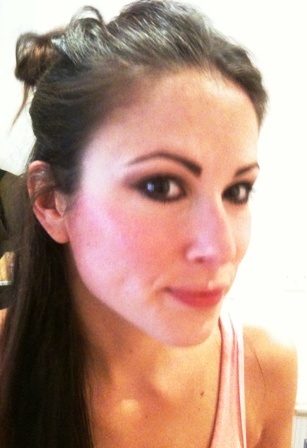 You can’t tell from the pictures really, but the Living Luminizer gives the most beautiful glow. I put it on my cheekbones, upper eyelids and the corners of my eyes. It also looks great on the top lip too. Not only does it look great but it is so lovely to use. It feels soft and creamy and blends beautifully. That would be the high quality ingredients including castor oil, coconut oil and beeswax. It’s so natural and nourishing I love it! Then the Lip2Cheek. This is a little different in texture to the Luminizer – not as rich and creamy – but still very soft, and blends wonderfully. A little goes a long way, blended with your fingers, and you can add more to build up a stronger colour as you wish. Included in the ingredients is coconut oil, castor oil, beeswax, shea butter, jojoba oil and argan oil – so many nourishing and healing things! Yum. I’ve been using both products every day for the past couple of weeks and I’m loving the look they give! I’m usually a powder girl as I’m paranoid about cream products rubbing off throughout the day. However, these have amazing staying power! 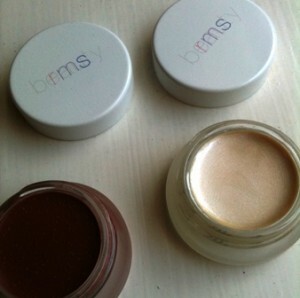 And, what I love is that I can use them on top of loose powder (I use concealer then translucent powder as my base). It blends fine, whereas other creams I’ve tried to use over any kind of powder have created a weird paste. So, the verdict? I absolutely LOVE both these products and would wholeheartedly recommend them. They’re not cheap, but they’ll last, the ingredients are top quality and nourishing as well as giving a beautiful, lasting look that can be toned up or down as you wish. I’m definitely an RMS fan and will no doubt be trying the whole range in due course. This entry was posted in Face, Healing Products, Makeup and tagged cream blusher, luminizer, makeup, mineral makeup, rms beauty, rose-marie swift. Bookmark the permalink. It helps a lot to read reviews like yours before buying a product. The products sound amazing and I will definitely give it a try. Thanks for the info and photos! These sound great! I’m loving the fact they have a peach lippy/blusher. I’ve been looking for that shade for ages…I’m really fair and I agree with you it would be a nice natural colour for the summer.